Jane Goodall (born April 3, 1934) is an English primatologist, ethologist, and anthropologist. Her 45-year study of chimpanzee social and family life in Gombe Stream National Park in Tanzania brought her both professional recognition and public renown. She founded and directs the Jane Goodall Institute, which provides ongoing support for field research on wild chimpanzees as well as conservation, development, and education programs. Goodall is active in efforts to advance the power of individuals, particularly our youth, to take informed and compassionate action to improve the environment for all living creatures. Valerie Jane Morris-Goodall was born in London, England on April 3, 1934. Jane was the first child of Mortimer Herbert Morris-Goodall and the former Margaret Myfanwe "Vanne" Joseph. Her younger sister, Judy, was born in 1938. Jane's father gave her a lifelike toy monkey called Jubilee, although friends thought it would scare her. Instead, Jane treasured the toy, and it still sits on her dresser in London. After the divorce of their parents when Jane was only eight, Jane and Judy moved with their mother to the seaside city of Bournemouth, England, where Jane's maternal grandmother and two great-aunts lived. Jane was interested in animals from her youth; this, coupled with her secretarial training prompted noted anthropologist Louis Leakey to hire her as his secretary during a trip to Kenya in 1957 and 1958. As her mentor, Leakey actually recruited her prior to university training specifically because she was not acculturated into current scientific trends, and could potentially "see" beyond the current paradigm. It was through this association that Goodall began studying the chimpanzees of Gombe Stream National Park (then known as Gombe Stream Chimpanzee Reserve) in July 1960. Although her discoveries were valid and astonishing in terms of current thought, Leakey felt she could defend her ideas better with more education. Therefore, he arranged for Goodall to return to the UK where she earned a doctorate in ethology from the University of Cambridge in 1964. Goodall has been married twice: first, in 1964, to an aristocratic wildlife photographer, Baron Hugo van Lawick. Their son, Hugo, known as “Grub,” was born in 1967. They divorced amicably in 1974. She married Derek Bryceson, (a member of Tanzania’s parliament and the director of that country’s national parks) in the mid-1970s, and they remained married until his death in 1980. Goodall is known for her landmark study of chimpanzees in Gombe Stream National Park, Tanzania. In 1977, she established the Jane Goodall Institute (JGI), which supports the Gombe research and is a global leader in the effort to protect chimpanzees and their habitats. With 19 offices around the world, the institute is widely recognized for innovative, community-centered conservation and development programs in Africa, and a global youth program, "Roots & Shoots," which currently operates in 87 countries. 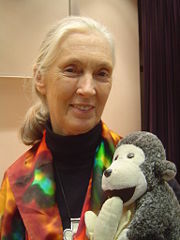 Goodall devotes virtually all of her time to advocating on behalf of chimpanzees, humanity, and the environment, traveling nearly 300 days a year. Goodall’s many honors include the Medal of Tanzania, Japan's prestigious Kyoto Prize, the Benjamin Franklin Medal in Life Science, and the Gandhi-King Award for Nonviolence. She has received honorary doctorates from numerous universities worldwide. In April 2002, UN Secretary-General Kofi Annan named Goodall a United Nations Messenger of Peace, and in 2003 she was named a Dame Commander of the British Empire (D.B.E.) in a ceremony held in Buckingham Palace. Goodall was instrumental in the recognition of social learning, thinking, acting, and culture in wild chimpanzees, their differentiation from the bonobo, and the inclusion of both species along with the gorilla as Hominids. Goodall pioneered and advocated the observation of primates in the wild as opposed to the previously established methods of observation within a controlled environment. Another innovation in her methodology was naming the animals she studied, instead of assigning each a number. Numbering was a nearly universal practice at the time, and it was thought to be important in the removal of one's self from the potential for emotional attachment to the subject being studied. Goodall thought the contrary, that becoming attached to her subjects helped her observations. Her success caused many to rethink the previous restrictions of un-involvement as necessary. Jane Goodall discovered that chimpanzees use tools, an ability previously thought to be uniquely human. One of Goodall's major contributions to the field of primatology was the discovery of tool use in chimpanzees. Goodall discovered that some chimpanzees used twigs as tools, poking them into termite mounds. The termites would grab onto the stick with their mandibles and the chimpanzee would then just pull the stick out and eat the termites. Previously, only humans were thought to use tools. Her mentor, Louis Leakey, responded: "Now we must redefine 'man,' redefine 'tool,' or accept chimpanzees as humans." Indeed, much rethinking has been done in light of her various discoveries. Goodall discovered that the life of the chimpanzee had some other disturbing similarities with human behavior. She observed infanticide and bullying behavior that could result in death. In 1974, at the Gombe Stream Research center the first known "war" between primates was observed and recorded for four years. This "war" stopped only when the rival group was completely eliminated. She also expanded the understanding of chimpanzees' diet. Previous to her observations, they were thought to be exclusively vegetarian, when in fact they eat a wide variety of other animals and sometimes eat other primates. Cooperative hunting in the primates was unknown before her observations of red colobus monkeys. Goodall observed many close relationships between the primates, some lasting a lifetime. In 1987, she observed a teenager named Spindle adopt an infant that was not a close relative, once again, pioneering the idea that primate behavior contains many elements previously thought to be exclusively human. Although a pioneer in many ways, Goodall is inexorably linked with another contemporary woman ethologist. Their work forever changed the way we view primates. Dian Fossey was also mentored by Louis Leakey prior to her doctorate at Cambridge University and, encouraged by him, worked with another primate in the wild, the mountain gorilla. She spent a brief internship with Jane Goodall to learn her methodology of observation. However, tragically, Fossey's life was cut short when she was murdered in her camp in Rwanda. Goodall has not only achieved great success professionally, she has also provided a positive role model for future generations. Through the years she has given the world a message of hope and developed methods of conservation, service, and stewardship over our environment. In her later years Goodall began to devote more of her time to advocacy on behalf of chimpanzees, animal rights, and the environment. Many of the children she encountered on her speaking tours expressed the opinion that the older generation had ruined the planet for the children now growing up. Moved by such concerns, she became an advocate for environmental and humanitarian causes. Her book, Reason to Hope, expresses some of the philosophy of hope that she has developed as a scientist and a spiritual woman who sees God working in people’s daily lives. Goodall has a good sense of humor and her life has captured public imagination. She appeared (cast as herself) in an episode of the animated television series The Wild Thornberrys entitled "The Trouble with Darwin." Her character has also appeared in numerous cartoons, both in print and on television. One anecdote in popular culture illustrates Jane Goodall's consistent ability to simply see things from her own perspective and in ways that may confound others. One of Gary Larson's The Far Side cartoons showed two chimpanzees grooming. One finds a human hair on the other and says to her mate, "Doing a little more 'research' with that Jane Goodall tramp?" When the Goodall Institute tried to take action, it was Goodall herself who stopped the effort because she found the cartoon funny. Since then, all profits from sales of a shirt featuring this cartoon have gone to the Goodall Institute. She wrote a preface to The Far Side Gallery 5 where she explained the controversy and praised Larson for his creative ideas that often compare and contrast the behavior of humans and animals. 2006: International Patron of the Immortal Chaplains Foundation; UNESCO Gold Medal Award; French Legion of Honor, presented by Prime Minister Dominique de Villepin. 1970. My Friends the Wild Chimpanzees. Washington, DC: National Geographic Society. 1986. The Chimpanzees of Gombe: Patterns of Behavior. Boston: Bellknap Press of Harvard University Press. Published also in Japanese and Russian. R.R. Hawkins Award for the Outstanding Technical, Scientific or Medical book of 1986, to Bellknap Press of Harvard University Press, Boston. The Wildlife Society (USA) Award for "Outstanding Publication in Wildlife Ecology and Management." 1990. Through a Window: 30 years observing the Gombe chimpanzees. London: Weidenfeld & Nicolson; Boston: Houghton Mifflin. Translated into more than 15 languages. 1991 Penguin edition, UK. American Library Association "Best" list among Nine Notable Books (Nonfiction) for 1991. 1999. Brutal Kinship, with Michael Nichols. New York: Aperture Foundation. 1989. Animal Family Series: Chimpanzee Family; Lion Family; Elephant Family; Zebra Family; Giraffe Family; Baboon Family; Hyena Family; Wildebeest Family. Toronto: Madison Marketing. 1963. Miss Goodall and the Wild Chimpanzees. National Geographic Society. 1984. Among the Wild Chimpanzees. National Geographic Special. 1988. People of the Forest, with Hugo van Lawick. 1990. Chimpanzee Alert. In the Nature Watch Series, Central Television. 1990. Chimps, So Like Us. HBO film nominated for 1990 Academy Award. 1990. The Gombe Chimpanzees. Bavarian Television. 1990. The Life and Legend of Jane Goodall. National Geographic Society. 1995. Fifi's Boys. For the Natural World series for the BBC. 1996. Chimpanzee Diary. For BBC2 Animal Zone. 1997. Animal Minds. For BBC. 2000. Jane Goodall: Reason For Hope. PBS special produced by KTCA. 2001. Chimps R Us. PBS special Scientific Frontiers. 2002. Jane Goodall’s Wild Chimpanzees. (IMAX format), in collaboration with Science North. 2005. Jane Goodall's Return to Gombe. For Animal Planet. 2006. Chimps, So Like Us. HBO film nominated for 1990 Academy Award. 2010. Jane's Journey. Theatrical documentary feature co-produced by Animal Planet. "Chimpanzees – Bridging the Gap". This page was last modified on 21 March 2018, at 14:43.